Agathi originates in Asia, specifically India, Malaysia, and the Philippines. Its native range extends to Burma and Australia. According to the World Agro Forestry Centre, the precise origin is unknown, but there are links to a closely related species found in Australia (S. Formosa): This close connection gives credence to the theory that the plant’s native to Indonesia. 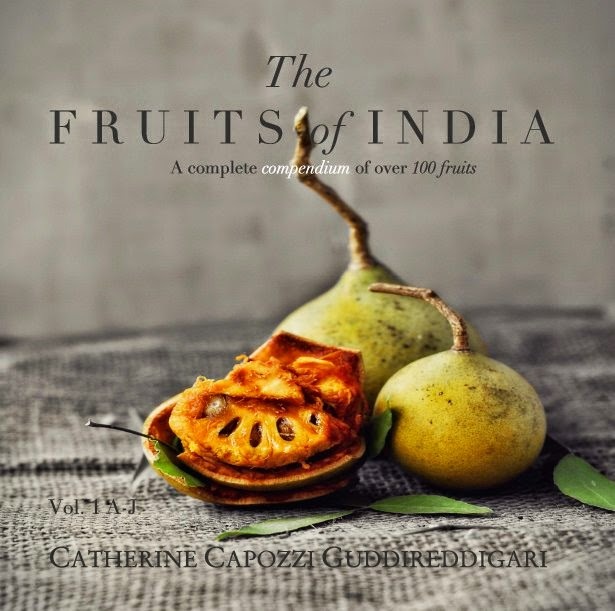 One of the plant’s earliest links to India lies in its namesake, agasthi. It’s believed that Sesbania grandiflora is named after the Vedic sage, Agastya. Considered the father of Tamil literature, Agastya likely lived between 6 and 7th century BC, and he specialized in medicine, spirituality, and language. Today, agathi grows throughout Mexico and the US Southwest region, the warmer areas of South America, and parts of Africa. In West Africa, for example, agathi’s been cultivated for the past 150 years. It’s also an exotic plant in Cuba, the Dominican Republic, and Nepal. 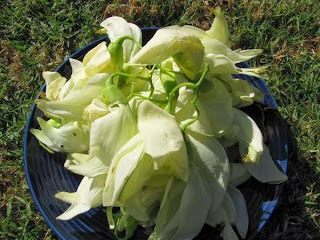 Agathi is not a commercial crop, and the flowers do not sit in wicker baskets awaiting sale in the major produce markets. Instead, they manage a humble existence growing in the banks near major crops, and in gardens. 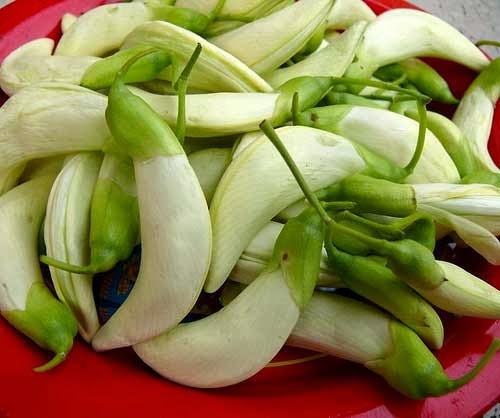 Sometimes, bunches of the leaves appear in local produce stalls, likely to appease the older generation who insist on the plant’s numerous health benefits. Though the flowers feature in some traditional cuisines, one gets the impression that their inclusion was born from necessity rather than taste. And yet, agathi makes cameos throughout the kitchens of Laos, Thailand, India, the Philippines, and Indonesia. Many accounts of agathi dishes are born from children who recall their parents plucking parts of the plant for use in homemade dishes. In India, the plant grows in abundance throughout many states, including Tamil Nadu, Andhra Pradesh, Kerala, Assam, Gujarat, and Bengal. They thrive in hot, humid areas and can grow like weeds in close quarters. Agathi leaves taste bitter, sour, and mildly tart. Most cooks counteract this bitterness with coconut milk, and some swear by the addition of garlic to combat the stomach pain arising from consuming too much agathi. The flowers are also bitter and astringent, but the white are less so than the red. It’s possible to reduce the bitterness by removing the stamen. The flower’s texture is mildly crunchy and fibrous, but pressure cooking or steaming for ten minutes will soften it. It’s also best to choose the flowers that have not yet bloomed, as these too will be softer and less leathery. Indeed, the leaves are an excellent source of calcium and iron. The abundance of these nutrients is one reason for its reputation as a bone strengthener. Agathi’s health benefits are exhaustive, and as such, the plant features in a number of traditional remedies dating back thousands of years. In Ayurveda, agathi leaves treat fever, sinus, and respiratory problems. It acts as a coolant, purgative, and worm-killer. According to the book, “Home Remedies,” the leaf is also an anthelmintic, diuretic, laxative, and can aggravate pitta. It has the potential to treat toxicosis, itching, and excess kapha. The flowers are acrid, bitter, and astringent. Local healers use the flowers to treat night blindness, headaches, catarrh, cough, and fevers. --According to a 2008 study published in the Journal of Cardiovascular Pharmacology, agathi’s antioxidants in the form of aqueous suspension protected rats from oxidative heart damage resulting from exposure to cigarette smoke. --As per a 2011 study published in the International Journal of Pharma Tech Research, scientists discovered that the ethanol flower extracts had great wound healing potential, and in fact yielded better results than the control group treated with 2 percent Nitrofurazone. --A 2010 study published in the International Journal of Engineering Science and Technology found that, when tested in hyperlipidemic rats, parts of agathi plant decreased serum cholesterol levels. --A 2003 study published in the Brazilian Journal of Pharmaceutical Sciences affirmed the plant leaf’s traditional use as a diuretic, showing positive gastric motility. --According to a 2001 study published in Springer, bark extracts illustrated potent antiulcer activity. --As per a 2002 study published in Phytotherapy Research, agathi leaves illustrate anticonvulsant activity, thus affirming their traditional use in treating epileptic fits. --According to a 2011 study published in the Journal of Ethnopharmacology, the plant’s ethanol extracts exhibited anticancer activity when tested on Ehrlich ascites carcinoma-induced rats: the group experienced decreased tumor sizes, a longer lifespan, and cancer cell count. --A 2010 study published in the International Journal of Pharmacy and Pharmaceutical Sciences indicates that the leaves have potent antiulcer properties when measuring its effect on gastric acid secretion in rats. Ripe agathi leaves are green and pliable. Avoid dried, desiccated leaves ready to fall from the main stem. Young white agathi flowers have closed white petals in the shape of a crescent. As it blooms, the crescent grows longer and at last, a few of the butterfly-like flower petals become separated and billowy. Many parts of agathi can be exploited in dishes: the young leaves, giant white flowers, seeds, and tender pods. To prepare the small, ovid leaves, first remove them from the stem: Achieve this by pinching the stalk with the thumb and forefinger, and then sliding down the main branch. The leaves should fall away with ease. Rinse the leaves in a colander to remove any dirt or sediment. They are now ready to be sautéed, pressure cooked, juiced, or boiled. To prepare the flower, remove the stamen and calyx. This will improve the flavor substantially—otherwise, expect the flower to taste bitter. Wash gently. Some recommend squeezing the flowers to drain its water, while others insist that this clears the flower of its sweet nectar. Prepare by deep-frying in batter, sautéing, stewing, steaming, grilling or simply eat raw. If steaming the flowers, do so for ten minutes, and then transfer to cold water. Adding salt to the warm water will also boost the flavor. For the leaves, agathi keerai is one of the most common dishes. This is, simply put, sautéed greens. To make, heat oil on the stovetop: use mustard, coconut, or safflower. Heat mustard seeds until popped, and add garlic and onion if desired. Next, add urad or moong dal, red chili, and green chili. Throw the leaves into the pan, along with turmeric, asafetida, and salt. When the leaves are sufficiently soft, toss in dal and shredded coconut. Some add the leaves to coconut milk soup as well. For the flowers, a Bengali delicacy is bok phool bhaja, or, blossom fritters. To prepare, remove the stamen and calyx. Make a thick batter of gram and rice flower, baking soda, chili powder, nigella seeds, sugar, and salt. Dip the white flowers in the batter, and then deep fry until golden brown. It’s also possible to make stuffed flowers: make a concoction of finely chopped sautéed tofu, garlic, ginger, soy sauce, and coconut oil. Use a paring knife to cut a slit in the flowers, stuff with the filling, and then deep fry or bake as a healthy alternative. Or, make Burmese sour soup from the flowers: In a pot, heat cooking oil and coarsely chopped chives. Next, add the prepared flowers (sans stamen and calyx), and two cups of water. Cover, and let it simmer for five minutes. And tamarind juice and salt to season. It’s also possible to simmer the flowers in a spicy tomato-based broth, or a thick coconut milk broth. Add the steamed flowers to a traditional Indonesian dish, pecel. The dish is an amalgam of other vegetables—such as sautéed greens, carrots, and lettuce—a protein source, rice, and a spicy sauce often made from peanuts, garlic, lime, tamarind, and chili. Agathi’s other name, “hummingbird flower,” is named for its resemblance to a small bird sitting in the tree. A very very informative blog!! Thanks a lot for such a great amount of information in a single blog. The only problem I am facing is to find the raw materials you have mentioned!! However I get all the cereals and other things from qusec.in but where do I find this Agathi flower?? Please inform me if its available in any particular stores! Thank you. A very informative blog!! And thanks for Nidhi for having given a valuable site http://qusec.in/. Awesome detail on Agathi.. We are planting Agathi in an acre in our farm near Chennai and was searching for how to profitably market it - landed in your page.. Lot of valuable inputs. Thank you so much..
Glad to have helped--good luck with the agathi endeavor! I have read your blog its very well maintained and good content. Isn't agathi a tree? I come from interior Tamil Nadu, where I have seen only an agathi tree; it is a small tree, but definitely not a plant. very useful information thanks for the same. Dear DMontford & others on this blog! Wish to share with all that I am aware of this Agathi and its immense health benefits. All such wondrous herbs and other products nature offers us are beneficial in manifold ways! This is I believe good for people suffering from 'fits' to addiction problems and so on. As for DMontford's query on how to use it.. well the leaves can be sauteed and combined with raddish grated in equal volumes and seasoned with cummin seeds and had as a salted soup every morning for kicking off the smoking habit! I had viewed this in a Tamil Channel show on 'Kalaignar' TV in South India (Chennai). The expert hosting host is Dr. Amuda Damodaran, for your information. I could be contacted at jvydehi@gmail.com as well for related queries. Best!!. Thanks very much for the information. Theres lots of sesbania trees growing at my home but I thought its a ordinary tree. Now I understand the importance of the tree. Il try the leaves and the flowers. Thanks much. I live in USA . I have this plant but the flower is red. Leaves and flower of this plant is edible?? Yes, the flowers and the leaves are edible, same as the white variety. Superb write up and so comprehensive. 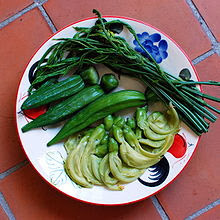 Here in the Philippines, we call this plant Katuray or Gaway-gaway. We use Agathi alongside onions, garlic, ginger, sugar, salt and vinegar to make a sumptuous sweet sour dish - an all time family favorite.